Office of Management and Budget Director Mick Mulvaney on Wednesday defended the Trump administration’s plan to freeze all federal civilian employee pay in 2019 and more broadly reduce the frequency of step increases moving forward in favor of performance-based pay. 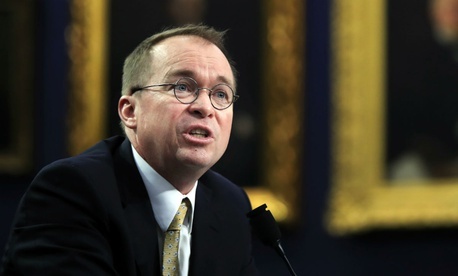 In testimony before a House Appropriations subcommittee, Mulvaney, who splits time between OMB and the Consumer Financial Protection Bureau, said the General Schedule pay scale is outdated and in need of reform. The White House’s fiscal 2019 budget proposal freezes all civilian federal employees’ pay in 2019 and in part replaces the across-the-board pay increase with a $1 billion interagency fund for cash bonuses and performance-based pay pilot programs. But while the Trump administration proposed that the money in the fund be appropriated in fiscal 2018, it was omitted from the omnibus spending package enacted last month. Mulvaney did not address the fact that Congress has not committed to providing money to reward high performers in lieu of step increases. But he argued it would be better than the current system at providing positive performance management incentives. Rep. Sanford Bishop, D-Ga., pushed back on that idea, arguing that removing step increases could effectively reduce workers’ motivation to excel and dissuade people outside of government from joining the federal workforce. Mulvaney countered that poor performers already have no incentive to improve, in part because managers are hamstrung in the degree to which they can increase employees’ pay. In a statement on Wednesday, National Treasury Employees Union National President Tony Reardon again decried the White House’s plan to freeze employees’ pay in 2019 and called on Congress to enact a 3 percent across the board raise for feds. “If the federal government is to have the ability to compete with the private sector in recruiting and retaining a skilled workforce, it is essential that the federal government provide its workers a pay increase,” he wrote. Mulvaney also gave an update on the status of various agencies’ reorganization plans, which have been under wraps as “predecisional” since departments first submitted them last summer. He said much of the focus of the plans, which he anticipates will be released in May, is on eliminating duplicative services.